The EU has lifted an arms embargo against Uzbekistan, despite continuing concerns about human rights in the Central Asian nation. 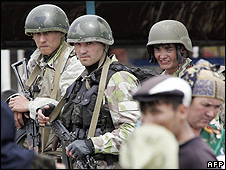 The embargo was imposed in 2005, after Uzbek government troops killed more than 100 mainly unarmed opposition protesters in the city of Andijan. EU foreign ministers said the aim was to further encourage the Uzbek authorities to improve human rights. International human rights groups have strongly criticised the EU's move. The EU imposed sanctions on Uzbekistan in 2005 after the authorities rejected calls for an international inquiry into the events in Andijan. The decision to lift the arms embargo comes after Uzbekistan released some political prisoners and abolished the death penalty. But the country's strategic position in Central Asia seems to have been the main argument, together with its rich energy resources and its support in supplying German troops in neighbouring Afghanistan. EU foreign ministers said they remained seriously concerned about the human rights situation in Uzbekistan and would review it within a year. They called on the Uzbek authorities to release all jailed human rights defenders, guarantee freedom of speech and fight child labour. But groups like Human Rights Watch and Amnesty International say the decision to end the sanctions fails not just the victims of Andijan and their families, but also dozens of human rights defenders and journalists who are still being harassed, tortured and detained today.